You are here: Home>Topics>World War 1>A WW1 TROPHY FOR THE TOWN OF WARE ? 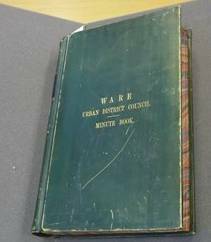 A WW1 TROPHY FOR THE TOWN OF WARE ? Seeming not to be .......? 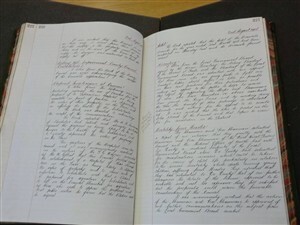 Extracted from the minutes of Ware Urban District Council for the period of the Great War and a few months afterwards. 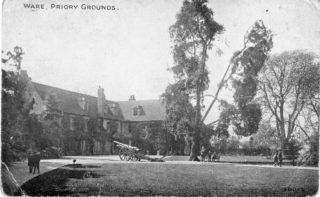 It is now mid December 1918, and the town of Ware and the surrounding District are busy making arrangements for commemorating the end of hostilities, welcoming back those who had gone to War, and getting life back to normal. Food was still under strict control, and the Council was in the early stages of making plans for provision of social housing or “housing for the working classes” as it was termed at that time. After almost 100 years one entry in the Ware UDC minutes of those days provides a slightly lighter interlude and a possible conundrum. The Chairman of the Council was considering the possibility of obtaining a War ‘trophy’ for display in a prominent position in the Town. Minute from the Council meeting dated 18th December 1918 – “The Chairman suggested that application should be made for the grant of a gun captured from the enemy for the Town of Ware, and it was resolved that application be made and the Clerk was directed to apply accordingly”. After only a short wait a reply was received, and reported. “Gun for Ware A letter from the War Office , Trophies Committee, was read stating the question of a general distribution of guns and the methods to be employed is now under consideration of the War Office Trophies Committee and that in all cases units who have substantiated their claims to trophies were asked their wishes as to allocation. It is not clear from the minutes whether a reply was sent to this communication defining what was required, or whether it was assumed that using the term “gun” in the original request was sufficient. In any event, the following somewhat disappointing response was received and reported. 1 German machine gun – damaged. 1 German machine gun ammunition box. 1 German machine gun ammunition belt. the cost of carriage to be borne by the consignee, and asking for a communication to be made to the Ordnance Officer, Croydon Barracks, as to where the stores should be sent. 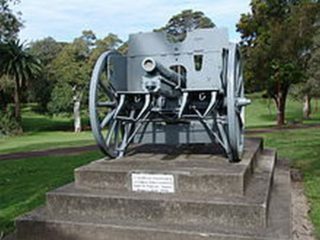 The Clerk reported his reply to the communication which was approved of, and it was decided to accept the offer, but to urge that the Field Gun asked for should be supplied”. The response, clearly a disappointment, was no doubt offering an MG08, a development of the gun originally designed by Hiram Maxim. Not much of a “trophy” though – completely useless for outdoor display. What happened in the end ? Did the Town of Ware obtain a larger gun for display somewhere ? If the “damaged” machine gun plus accessories was accepted after all, what happened to it ? One thing is highly likely. If a captured field gun were obtained, after all, it would almost certainly have been taken for scrap 20 years later upon the outbreak of WW2. It would appear that, after the initial disappointment, Ware DID receive its sought-after war trophy – in fact two of them. 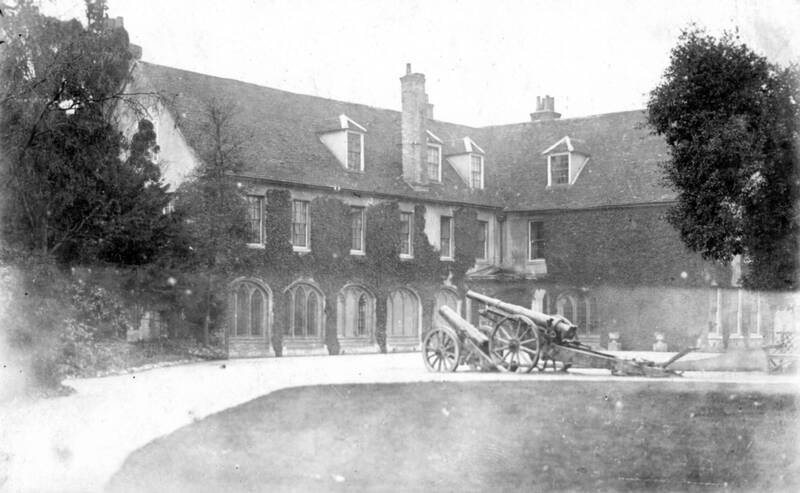 My thanks go out to two ladies who brought to my attention that two long- forgotten pictures at ‘The Priory’ show the guns in position outside. Only further delving into the minute book will reveal how and when the original decision of the War Office was overturned, but this must be left for a future occasion. It is unlikely that the guns will have been on display for more than 20 years, and will have joined the many others taken for much needed scrap as WW2 approached. Thank you again Jill – the Town Clerk of Ware and Lis Barratt – Curator of Ware Museum for your help in closing off this mystery. This page was added on 25/06/2014.